"There's plenty of camping left", but as North Star’s 74th summer comes to a close, it is time to start settling up with the greatest counselors and staff members in the world, who work tirelessly make our camp such a special place. In preparation for a great sendoff, we are asking Alumni and other members of the North Star Community to join current staff members in the third annual North Star Settle Up Challenge to support Camp for All Kids. The Settle Up Challenge is a gift-matching campaign that invites members of the community to match donations to Camp for All Kids made by our counselors and staff from their end-of-summer camp paychecks. Camp for All Kids, the successor to what you may remember as the Scholarship Fund, facilitates racial diversity at North Star and five other summer camps (Birch Trail, Chippewa, Kamaji, Menominee and Timberlane) by providing scholarships called “camperships” to kids from underserved communities to attend camp. It’s a simple and highly effective way to benefit kids who otherwise wouldn’t get a summer camp experience. Many of you were counselors at North Star, so you know that giving back part of a modest camp salary is quite generous for our staff members. We had tremendous results last summer when more than 50 North Star staff members donated over $3,800, and 40 North Star alumni pledged matching donations totaling over $22,000. As a result, the Settle Up Challenge raised more than $25,000! You can make your pledge by simply emailing Andy (andy@northstarcamp.com) with your commitment. You can set a cap on your matching gift. We already have raised over $25,000 in matching donations for this year, and are looking to beat last year by even more! Here’s how the Challenge works: If a North Star counselor contributes, say, $20 and ten alumni match it, that donation turns into $200. (We suggest a minimum of $500 for your matching gift.) We will total up the donations from current camp staff and contact anyone who donated during the week of August 13th to tell you the amount raised by the staff. You can then go to the Camp for All Kids website and make your tax-deductible matching gift. This year, 28 campers attended North Star through Camp for All Kids “camperships.” These kids not only make lifelong friendships and experience the magic of camp, they also contribute so much to the camp culture. North Star contributors have been the heart and soul of Camp for All Kids since its inception. Please contact us at andy@northstarcamp.com with any questions. Yesterday was the first ever North Star Games, for which all of camp was drafted in to 4 constellation based teams, Hydra, Hercules, Dorado, and Mensa. The event officially kicked off Friday afternoon with the North Star Pow Wow, which celebrated the Native American history of the Northwoods. Educating our campers about Native American history, culture and traditions, and creating a connection with the land has always been a priority throughout camp’s 74-year history, and our campers and staff feel that this new take on a Pow Wow Day is a more empathetic and appropriate way to accomplish those goals. 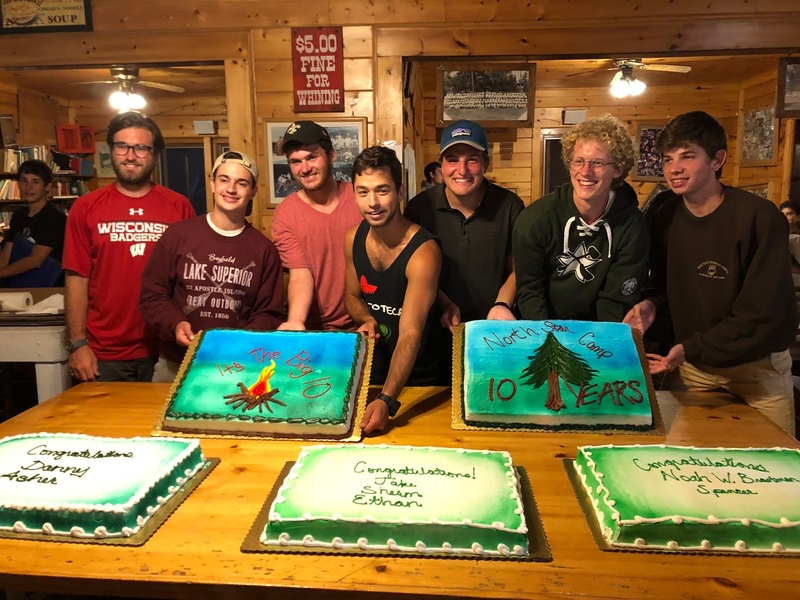 With the help of a few Pine Manor campers, Andy discussed the history of our Pow Wow Day, how the days traditions have changed it over the years, and the decision to move on to The North Star Games this summer. He also shared the history of local tribes and allowed the campers to see a few native artifacts we have at camp. Eli Gould, Aidan Weinberg and Louis Schienfeld then led the rest of the campers in a few traditional Native American games. A favorite was "The Running Game", which is a distance running race with one major catch, runners need to be screaming at the top of their lungs. Our Friday Night Service focused on this transition, as well as the importance of conservation and respecting the land. After taking time to learn about some of the first environmentalists, the Chippewa tribe, and their modern counterparts, we held the opening ceremony for The North Star Games. In 1944, Lou and Renee decided to buy the land that became North Star when they saw the Council Ring. They looked to the sky and saw the North Star, and camp had a name. The teams walked from that spot to an athletic field lined with lanterns. Andy told stories about the North Star and what it represents, and the Senior Village captains from each team lit a torch to signify the beginning of the competition. In the morning, opening ceremonies continued with a cheer from each team followed by the launch of their team rocket. The day itself included many favorite camp events, such as leg wrestling, Polaris Ball (a modified softball game), Canoe Tug of War, and log rolling, water polo, and a variety of swimming events. There were also a few additions, including Stand Up Paddleboarding, rocketry, and a plaque competition. There was a silent lunch (because there is no sound in space). Despite rain, the enthusiasm around camp was palpable, and we were able to fit most of the scheduled events in. The staff softball game to decide eating order was modified into a dodgeball tournament in the VICtory Fieldhouse, which also hosted Floor Hockey, which was played in lieu of Speedball. The day concluded with a closing ceremony in Mike Hall, highlighted by a performance from The Pinery Boys, who treated camp to a performance of authentic logging era music. The sportsmanship of campers and staff was on display throughout the day, and even though "it just doesn't matter", Hydra ended as champions of the first North Star Games. The last four days have been busy with special events, most notably an earlier than usual Camper Counselor Day. We have also welcomed prospective campers and their families into camp for Rookie Weekend, celebrated the Big 10, and had our last Cruiser Day of the summer. Today is Bi-Camp, and a contingent of campers from Camp Nebagamon have joined us to compete in a variety of camp activities. Camper Counselor Day gives our Senior Village campers an opportunity to experience what it is like to be a staff member. The campers select a staff member to be for the day and swap clothes with them. The villa campers are "counselors" for the day, teaching activities and supervising cabins. The staff enjoy the opportunity to sample some of the activities they have wanted to try all summer. The Senior Village campers finish Camper Counselor Day with a sense of gratitude for the work their counselors do to make the summer special for them. On Saturday and Sunday, we hosted 11 families for our second session Rookie Weekend. In addition to a tour for the boys and parents, prospective campers are able to participate in a bit of camp to see what like at North Star is like. They play in challenge games, swim during an organized free, and even have a chance to sign up for two activities of their choice. They also played in our Dodgeball Extravaganza evening program, trying to stay in for as long as possible while playing against the staff. Rookie Weekend is a great opportunity for a prospective North Star family to see camp running at full speed. If you know anyone who may be interested in attending Rookie Weekend in 2019, fill out the Refer a Friend form. Sunday night we celebrated the Big 10. This year, we had seven honorees who have spent 10 years with us. This year's Big 10 men are Noah Broutman, Ethan Rane, Spencer Malkin, Asher Borstein, Noah Sherman, Danny Levy, and Jake Kraemer. Visitors and staff told stories to share some of the memorable moments these guys have had at camp before we all enjoyed some cake to mark the occasion. Yesterday was our last Cruiser Day of the summer. Cabins enjoyed many of the staple Cruiser Day activities, such as tubing and trips to the resort across the lake. Cabins also had the opportunity to make Oreo cookies and J4 made their own pies for a pie eating contest. J2 and J3 had a challenge day, spending the day together and participating in unique sports such as water polo. The Intermediate Village visited Wild Mountain, a waterpark in Taylors Falls, Minnesota, for a day of waterslides, go-karts and alpine slides. Today is our annual Bi-Camp competition with Camp Nebagamon. They are joining us for a day of friendly competition in Tennis, Swimming, Canoeing, Sailing, Chess, Archery, Riflery and Cross Country. We are proud of our campers for being such gracious hosts and welcoming Nebagamon to camp in such a friendly manner.